Since search engines became commonplace, it has been the goal of content creators on the internet to try and use their algorithms to get the content from their sites at the top of the ranks. However, the rules that we use to reach the coveted first page of Google’s results are often changing. You can also read SEO important factor. To adapt with these changes, you need to know what they are. 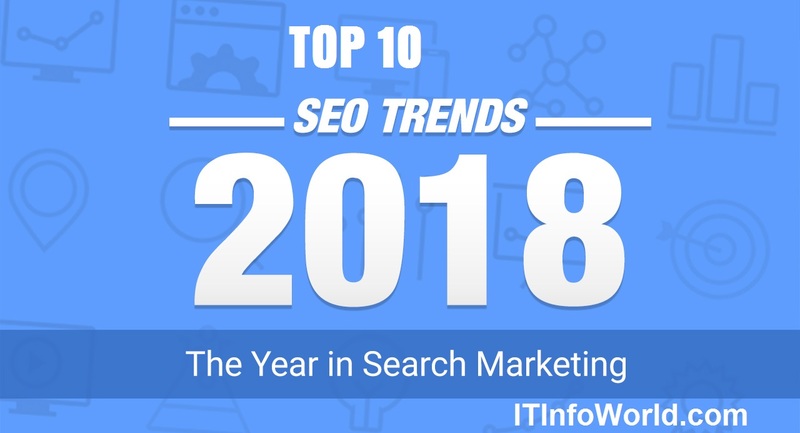 So, in this article, we are going to look at the top 10 trends in SEO that you will see in 2018. With the rise of devices like the Amazon Echo, it’s no surprise that voice commands are starting to control the way that we use search engines. Google has already noted that 20% of mobile searches are voice commands and that number has the potential to grow exponentially. What does this mean for SEO, though? Well, the way people type in a search is much different from the way that they talk. As such, the SEO phrases and keywords that are used online must now be tuned to suit the way someone would verbally ask a command rather than just the keywords they might type. This is especially relevant when crafting long-tail keywords. A concept that is both compliments and outdoes voice-controlled searches is the use of mobile devices for searching. In the modern world, it is simply more easy for most people to use their phones to search things on the go rather than sit down at a computer every time they need to find an answer to a question. In fact, nearly 60% of search queries come from mobile devices. To make sure that your site ranks on mobile, you need to make sure that your site is mobile-friendly. To do this, you can use a tool like a website auditor to assess the properties of your website. The truth is that in today’s world, we are used to short, quick answers. This means that we are more likely to pay attention to the fastest, most straight-to-the-point answers available. In fact, Google recently found that about 30% of the answers found on Google are found in these featured snippets rather than users clicking on full articles. Anymore, this usually means using the answers that Siri or Google Assistant read back to us instead of sitting down to sift through a full-length article. For those crafting online content, this has led to more carefully crafted article descriptions. In addition, though, it has also resulted in the creation of shorter form content such as SEO-optimized Q&A content. As we move away from long-form written word, we also move toward visual media like videos and infographics. This means that the technology that we use is evolving to recognize the content of visual media the way that it already recognizes the content of written media. The switch to visual media means that content creators will have to work to optimize this type of content. The obvious optimization is to carefully craft descriptions, titles, and tags. However, you can further prepare media like videos for search engines is to take extra measures like inserting transcripts (which would include keywords) and making sure that the rest of the page that the video is on is optimized if it is on your own website where you can more easily control the content surrounding it. As earlier entries in this article suggest, most people are concerned with getting the answers to their search queries as quickly as possible. This is more than just simple formats and clear answers, though. Another thing that can boost your ranking in a search engine is how fast your website loads. You can use tools like Pingdom to test the loading speed of your site. To be considered a secure website, a website must obtain a secured website certificates (SSL). You can easily discern if a website is secure if it has an “https” leading its URL. Once upon a time, not being a secure site didn’t mean much - your site would lack the “https” and a browser like Chrome might show the user a warning that the site wasn’t secure. Now, though, search engines like Google have updated so that if your website is unsecure, your content will be pushed down the rankings no matter how optimized your content is. When you are optimizing your content in 2018, you need to think beyond how Google or Bing will rank your content. In addition, you need to think about how your content will come across on social media platforms like Facebook and Twitter. This means that you will need to play to hashtags # and create titles that will generate clicks to package great content. When someone uses a search engine, the results usually don’t just depend on the words they type in. In fact, many search engines use other factors such as the user’s location, search history, and interests that they’ve shown. Of course, you can’t really do much about user’s search history. However, you can combat this by getting ahead. Your goal is to get to unbiased users’ clicks which will make you a preferred option in the eyes of search engine personalization. With the increase of SEO, many websites used a technique of overstuffing keywords as its landing page builder. However, search engines are getting smarter. Google is updating itself, in particular, to recognize the difference between content and filler and it now tends to force useless filler further down the rankings in favor of actual, well thought out content. If there is one phrase that has been dominating the internet lately, it’s “fake news”. In response, many search engines are using AI to check for false information. Of course, this is a new and difficult thing that search engines are trying to do but they are, nonetheless, attempting to stamp out false media. As such, it is best to try and steer away from the controversy entirely by making sure that your content is optimized with true facts and maybe even supported with some reliable backlinks. Get free powerful dofollow backlink from Link World, the leading social bookmarking website.